Bunga bunga loosely describes the energetic antics of courtesans of an Italian Prime Minister. 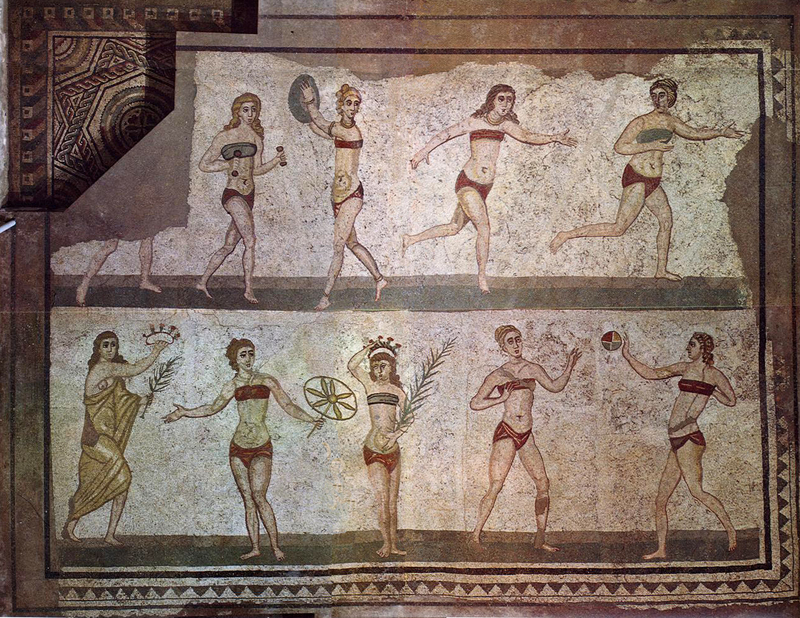 The coarse colloquialism is now also synonymous with the perceived failings of contemporary Italy, so it is perhaps no surprise that a mosaic in the Late Roman Villa del Casale at Piazza Armerina showing women in bikinis is sometimes taken to mark the beginnings of an apparently infinite age (in the minds of many Italians, at least) of moral decline and fall. Until recently, a sign in this UNESCO World Heritage Site apparently urged visitors to hasten to feast their eyes on these shameless hussies, filling a dark room off the Hall of the Great Hunt. In fact, these graceful ladies were preparing for serious games, and one blonde even shapes up to hurl a discus. Such, however, used to be the asphyxiating heat trapped beneath the old plastic glass covering these precious mosaics that making it along the walkways as far as the bikini girls necessitated the stamina of a serially re-elected septuagenarian Italian PM. Bikinis seemed appropriate attire in the greenhouse conditions, all but justifying the pragmatic purpose of the old sign. The bikini girls of Piazza Armerina. Fragment of an earlier geometric can be seen in the top left-hand corner. The Villa del Casale at Piazza Armerina is now no longer a hothouse. Much of it has been gracefully re-covered with a new roof designed by the Milanese conservation architect, Gionata Rizzi, who encouraged me to see and comment upon it. (His portfolio includes covers at the great Mayan capital of Copán in Honduras and Herculaneum, the smaller of the buried Vesuvian cities.) Deep in the building, the air is now cool and as a result there is time (or rather the will) to admire these trim athletes for what they are, as well as the remarkable ensemble of other narrative floors that surround them. Located in the centre of Sicily, in a deep valley on the western side of the modern town of Piazza Armerina (the so-called ‘city of mosaics’), this place possesses an Arcadian beauty. Each year, 400,000 visitors make this pilgrimage to see the mosaics – mostly in the spring and autumnal months because the legend of the 1950s hothouse cover is well known. A shantytown of kiosks has evolved around the villa, each selling souvenirs, some as old as the perspex cover itself. New wooden kiosks have been inserted into the zone between the expansive car park and the archaeological site, doubling the vending opportunities. So, this villa, with its €10 entrance fee, is generating upwards of €4m a year, a sustainable income that is likely to continue until someone discovers a better villa to market. Hence the need for the new roof: with more clement conditions, surely more tourists would journey to this secret valley in central Sicily? For doubters, two old parts of the villa (because the funds ran out) have not been re-roofed: the bath-house at the entrance and the separate tricoran reception room. In both, even before the sun is really up, the air is heavy and ferocious sunlight casts shapeless disfiguring shadows over the pavements. The new roof has been accompanied by two unexpected initiatives: brazen advertising for a nearby outlet shop, and ‘an exhibition’ (for that is what it is) of zany bronze sculptures and underwhelming installations. But it is the new roof and the (uniformly filtered) light that it throws on the floor-narrative of the villa it covers that have drawn me here on a summer morning. The Hall of the Great Hunt now pleasingly cool and extraordinarily clear. The villa covers three great terraces at the foot of a steep hill. Unusually for a Roman villa, it is arranged on three different axes. On the east side lies the first terrace, bounded by an aqueduct and containing private apartments, the grandiose basilica with its marble floor, and the celebrated Hall of the (so-called) Great Hunt. 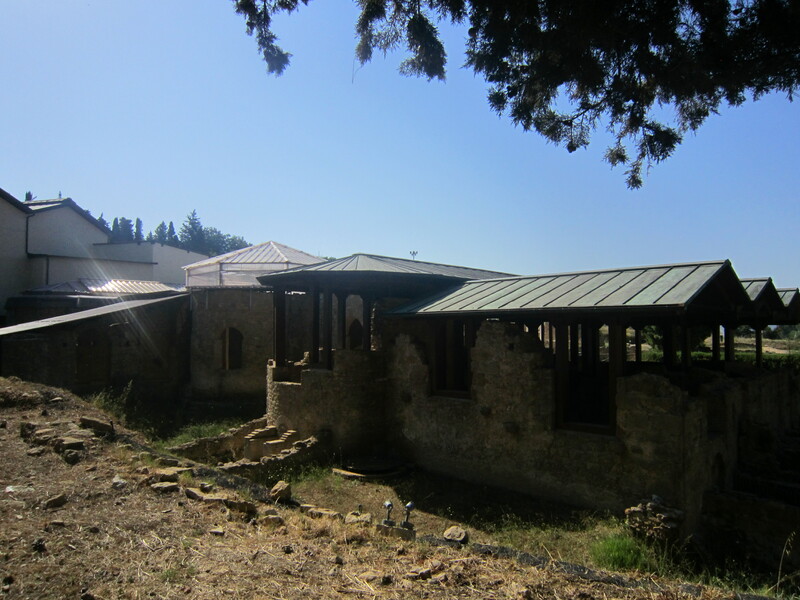 The second terrace is occupied by the peristyle courtyard and the dining room (triclinium) complex. The monumental triple-arched entrance to this palatial villa and the suites of baths occupy the first terrace. This compact yet massive structure was built on top of an earlier 1st- to 3rd-century AD villa at some time during the mid 4th century – though no one, amazingly, knows exactly when. The earlier roof designed by architect Franco Minissi in the 1950s invoked a science-fiction response to great archaeology. It consisted of a lightweight metal skeleton, sheathed with plastic and ventilated by small latched windows rather than the air-conditioning the architect had anticipated. 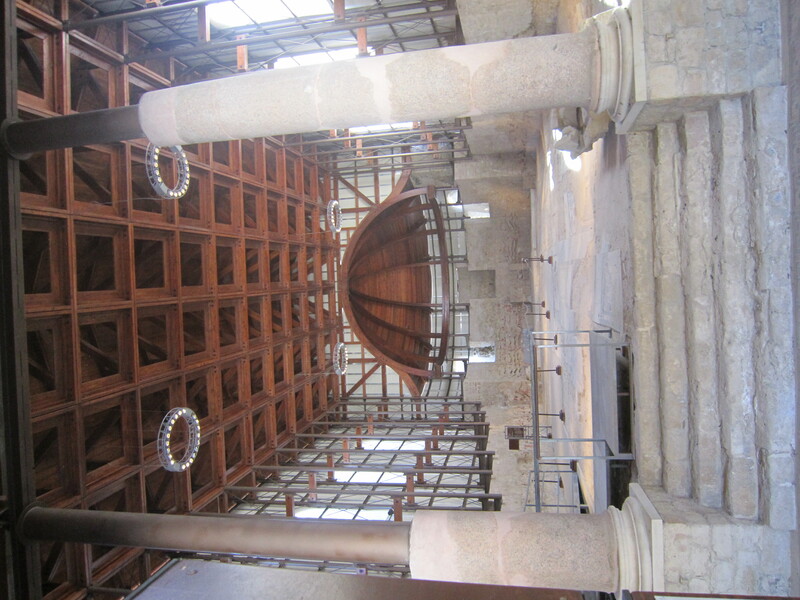 Minissi’s roof replaced a small, prosaic wooden version over the three-apsed hall, covered with clay tiles and supported on massive brick pillars. Built by architect Piero Grazzola in the 1940s, it had been likened to a hayloft. By contrast, Minissi’s design aimed to convey the volume of the rooms containing the mosaics with wall-walks that permitted visitors to see the pavements. The greenhouse effect, however, promoted irregular cycles of expansion and contraction that put the mosaics at risk. Meanwhile, the wall-walks were tight passages that compelled elbowing one’s way somewhat erratically through the ensemble of buildings, offering little sense of how the villa once functioned as a great house. For its time, though, Minissi’s design was a huge achievement, doing much to protect the mosaics as well as to secure them worldwide fame. That said, the translucent cover did not conjure up a palace – except perhaps on the moon. 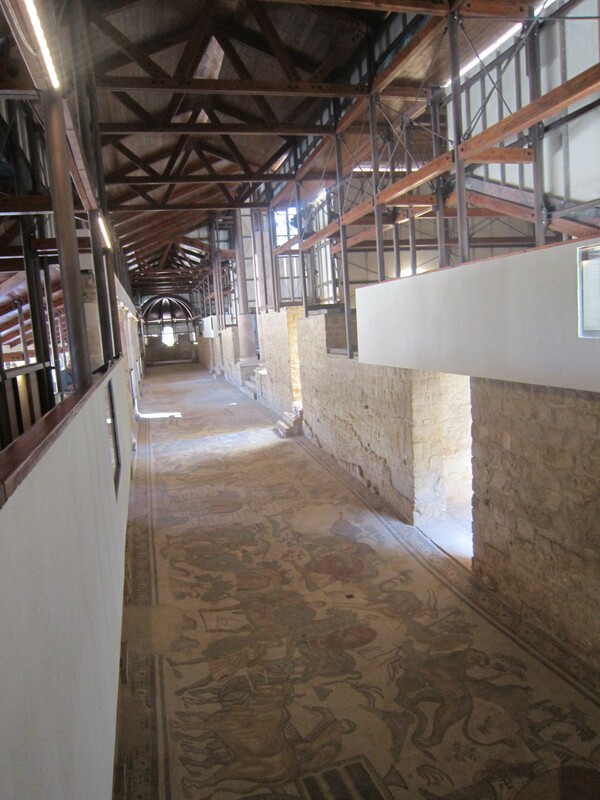 The great basilica with its marble floor. The internal cladding of the new cover is incomplete. The great achievement of Rizzi’s new cover is simple: the main house with its labyrinth of rooms arranged around the large courtyard feels like the home of a grandee with a voracious appetite for the visual myths and wonders of the then known world. Whether he was an emperor or simply a wealthy Mafioso, the galleries of extraordinary mosaics made for him now, like magic, make sense. The elegantly moulded apsed rooms with roofs supported on exposed beams have been cleverly recreated. The exposed aluminium uprights still need cladding, and apparently the columns and capitals were to be reproduced in wood following the techniques used in stage-set decoration to make sense of the classical articulation of the interiors. But these are details. This renewal is not some tawdry casino-like copy worthy of Las Vegas. The chief excitement generated by the new cover is the plain and simple fact that blazing sunlight no longer makes the mosaics invisible. The bikini girls, as a result, could not be clearer. Like all the mosaics here, the detail and colouring are truly thoughtful, the work (many art historians now believe) of North African craftsmen (see ‘Great Excavations’, CWA 61). Now cleanly lit, it is not so much the artisanal expertise that delights, as the intersection of mythical and contemporary stories arranged to enhance the design of the house. As in a great English country house, the imagery has an overarching cohesion. The bikini girls, positioned near to the long Hall of the Great Hunt, are being put through their paces opposite the ante-chamber to the master bedroom and close to the great reception hall. Perhaps some discreet mischief was being invoked, after all? In the cool balmy air created by this re-roofing, you, the visitor, can now judge! Just as clear are tiny sections of the first rather unappealing geometric mosaics that graced the great house. Who built Piazza Armerina and then who furnished it with the celebrated narrative pavements, pleasingly remains a debate between archaeologists and art historians, as the original excavations were rather impetuously made and failed to check the associated ceramics which might today be precisely dated to a historical personality. Spanning perhaps no more than two or three generations pivoted around the central and later decades of the 4th century, this place has an elegiac whiff of end of empire: in the Great Hall of the Hunt, which depicts scenes of Africa and India, its owner plainly attempted to position himself at the centre of the world. One other aspect of this new project is obvious: guards are absent! The elevated walkways, monitored presumably by cameras, make the intrusion of bored and disgruntled attendants superfluous. This ancient country house is now simply filled with people quietly gazing at the floors as though it were an air-conditioned art gallery. The peer-visitor experience is deeply satisfying. Beyond the villa’s monumental entrance, I found some draped sun-bleached plastic fences an irresistible invitation: beyond, under makeshift covers, lay remains of Patrizio Pensabene’s recent excavations of the Norman (Medieval) phases of the palace that have yet to be presented to the public. Plainly, after five centuries of abandonment, this mythic place became a palace again for the Arab and Norman conquerors of Sicily. Such a rich story is yet to be told, inviting yet more covers. Let’s hope Italy can find the finance. After all, the greatest house of the 4th-century world is now at last the treat for summer visitors that earlier architects aimed to make it.